I see threads like this Google Webmaster Help thread all the time. In summary they say, my manual penalty was revoked by Google after I spent the time cleaning up my mistakes but days, months, and even years later, my rankings, traffic and thus sales have not improved at all. Often, I'll see people get all excited after Google removes a manual action within Google Webmaster Tools, only to see that as false hope. 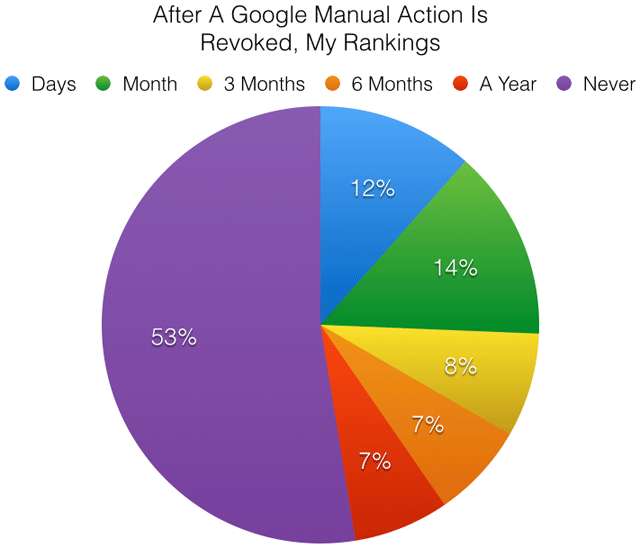 In early September, I talked about this in a poll I ran asking Does A Manual Action Removal Impact Google Rankings? We have almost two-hundred responses and the sad results are in. 53% said their rankings never improved, even after a year. 12% said they saw a ranking improvement within days, 14% said within a month, 8% said within 3 months, 7% within 6 months and 7% within a year. But 53% said never. I didn't ask if they saw a full recovery. If I did, I suspect that 53% number to jump to 90% or higher. Often, when it is a link penalty, the removal of the penalty doesn't help much. Why? Because those links that once counted, no longer do and thus the rankings will not return until you garner new, quality links. But with content or other spam issues, why no recovery? Have you seen the same? Do you agree with this poll?